Pureheart's curriculum offers proven step-by-step guides for breaking free of addictive behaviors, growing up in God and discovering your calling in life. I have been trapped in the bonds of sexual addiction for over 35 years and before coming in contact with the Basic Training Phase One Guide, I had tried many different counselors, 12 step support groups and read numerous materials on overcoming my sexual addiction with very little success or lasting change. Once I began reading the Basic Training material and following its instructions, God began to heal me from the inside out. It has been close to 8 months now since I last sexually acted out, viewed any pornographhy or had my mind inundated with immoral and impure fantasies. God has been systemically healing me to the point where I have not had any cravings to do anything but to live pure for God!! This is an absolute miracle for me and I know that it was large part due to this Basic Training Guide!! It continues to lead me step-by-step down my healing journey and each week I experience a greater level of freedom from my addiction and also a greater level of intimacy with God and others. This guide is a MUST HAVE for anyone who is suffering from sexual addiction, whether it's you or someone you know. There is such a tremendous need in the body of Christ right now because sexual sin is running rampant through the church and there have been very few resources and tools that have proven effective in actually addressing this issue and changing the lives of people. I cannot implore you enough to obtain this book for anyone battling this addiction; as for me, I will stake my life on the information in this guide that has changed me forever!! I remember going to basic training over 42 years ago with the USAF - it was tough for this out of shape teen - I had lazy habits that were not good in my relationship with the military - Military Basic Training helped take all that out of me. I had powerful help from peers and those over me - it changed my life forever. Sometimes we men get tired of going to men's conferences and meetings hearing others talk about sexual purity - because they all say the same thing. This book says some of the same things but in a much different way - it is practical, most men as they read will find themselves saying, "that's me - I've been there or I'm there now - Help!" And help is there - the author gives solid, practical, doable, real life suggestions on how to get help and how one brother can help another brother - we are all in the same battle (but often times we don't realize that) we are not alone. 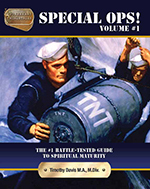 Pastors, elders, teachers, brothers, FATHERS and SONS - get this book, read it, start dealing with your purity issues (we all have them at some level)- THEN share this with your pastors, elders, teachers, brothers and sons and maybe your fathers - start learning how to stand in purity together - after the Word of God, "BASIC TRAINING! 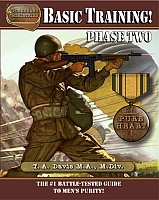 PHASE ONE" is one of the books that can help you do that. It is my prayer that God will use this book to change many lives - not just a good read - actually a difficult read (internally) - a life changing read. May the Lord Bless and speak to every man who reads this book. Bulk orders will receive a discount. Contact us for more information.